We started this business in March 2012, and are stay at home moms from Stevenson Ranch, California. Between the two of us, we have five children ranging from elementary school to college. Both of our families have had our fair share of lice encounters and became frustrated with the lack of knowledge and prevention that is in our community. Let’s face it…..this is not the typical business that one would think two moms would start. We are very passionate about educating moms, dads, grandparents, and children of all ages about head lice treatment and prevention. We want to share this knowledge with you in hopes to reduce the time lice exists in our neighborhoods and schools. Through our passion and commitment we decided to start Hair Queens, Inc., a caring and professional in-home treatment service. This is an annoying and sometimes stressful problem but adults and children can learn this is nothing to be ashamed of. We will help you through your current situation, and, most importantly, educate about ways to prevent re-infestation, how to cope with clean up, and keep an open line of communication. We hope you can recognize how important of an issue this is to us and our community. 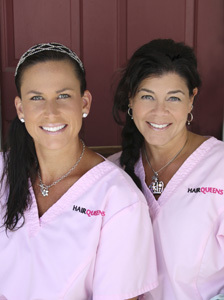 Hair Queens has branched out to Virginia! We are ready to help service your family in getting rid of head lice and educating you along the way. We’re currently servicing Fairfax, Vienna, McLean, Annandale and Alexandria, Virginia.